Bill King, David Smith, and Tim Batross of Madison County, Tennessee are doing what more local history buffs should do: cleaning and restoring long-forgotten family cemeteries. There are a lot of them in Tennessee and other parts of the country. I know of many cemeteries while doing genealogy or local history research that fall into this category. The tombstones are cracked and broken, the engravings wearing away from time and neglect. Not too long ago, Old Salem Cemetery outside Jackson, Tennessee–where Adam Huntsman and his three wives are buried–was one of them, overgrown and neglected. I encourage other local historians–myself included–to take the initiative and save these cemeteries for future generations. Ever since I was a kid, I’ve loved spotting state historical markers along the highways as I travel. I’ll start sharing them here from time to time. 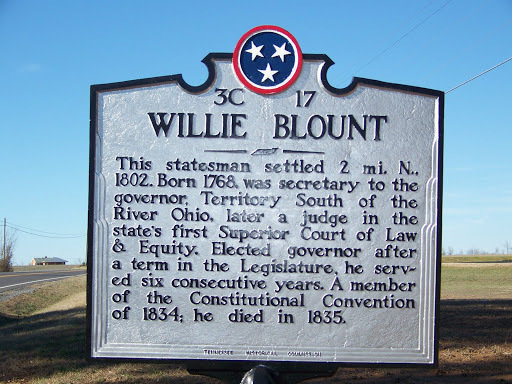 This one is located on Highway 41-A in Montgomery County, recognizing the fact that the fourth governor of Tennessee, Willie Blount, lived in this area. (Willie is pronounced Wylie.) Blount was a Democratic-Republican who served from 1809 to 1815 and was the half-brother of William Blount, governor of the Territory South of the River Ohio (present-day Tennessee) and one of the first U.S. Senators from the new state.